I've been feeling so productive lately, working through my W.I.P. pile! In the last week I have two, count 'em TWO finished projects that had languished for quite some time. So take heart, there is hope! First up this week, I finished my "Sleep" baby quilt, as part of the Proverbial QAL, being hosted by Krista of Poppyprint. More details about the finished quilt be can found here. So that was one was great to cross off the list, but I wasn't finished people! I already had backing and batting for the Kate Spain "Joy" plus quilt top I had finished a few weeks ago, so I got down to business and basted, quilted & bound it in about 3 days. Yipee! Another W.I.P. .... check! (you only get a teaser photo today, I haven't had a chance to take proper photos yet). By the way, I'm de-stashing some "Joy" fabric (you pay shipping), you can read more details here. Alright, so what am I actually still working on?? The big one in the works is still the Fussy Fairytales quilt for my little friend Eva. The top is finished, the batting is purchased, the binding is made, and what we're waiting on now is the fabric for the backing. We're going to create a backing like this one, using some of the leftover fabrics for the print strip, and Kona Buttercup, Camellia & Petal for the solids. YES you can do it!! Congrats on two finishes - I can only imagine! And I can't wait to see more of the Fairytales! It's looking awesome!! 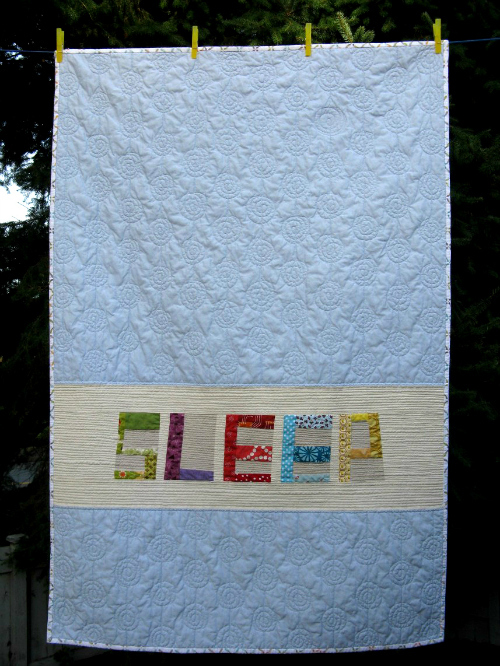 I really like the quilting on the "Sleep" baby quilt. The overall look is just wonderful. 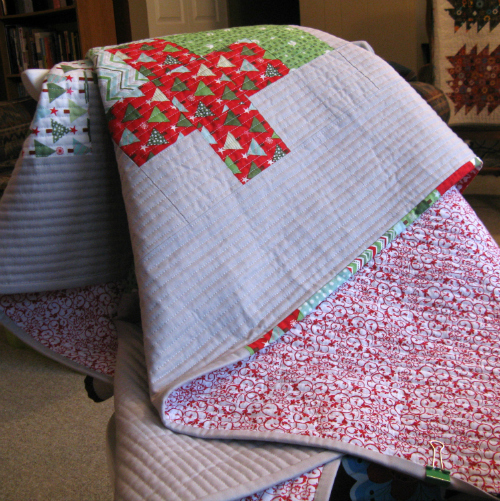 I love how you quilted your Xmas Plus quilt - it looks beautiful! You are an inspiration Heather!! And not just at getting that WIP pile wilted done, but how beautifully they are completed!! If you can get these finished like this, I bet you can tackle the last two! Go on, I dare you!! 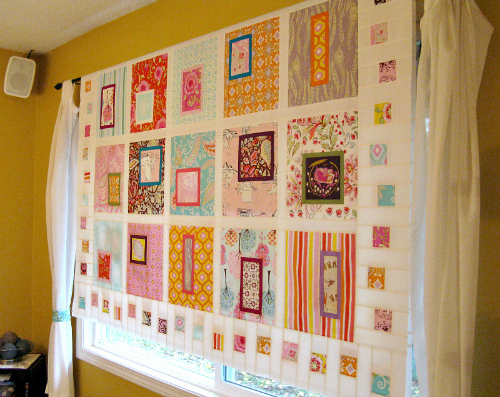 Love your Sleep quilt, and your Fussy Fairytales - cant wait to see that one finished! Wow! You have been busy! Nice work! I just love the quilting on the Sleep quilt. Every time I see it, just makes me want to try that design! Wow, your fussy fairy tales quilt is looking fantastic!! Great finishes Heather! Looking forward to seeing Fussy Fairytales finished too. I think you certainly can finish up before starting something new...unless you are anything like me! You've been very busy....love each one of your quilts. Heather, these are all just fabulous! And no WAY could I ever finish everything before starting something new! You're really chugging right along! Great job shortening your WiP list. :) I normally can't wait to start new things, but I'm trying to hold off on new things for the remainder of the year until I at least make a drastic dent in my list. You have been on quite a roll! I totally think you can do it too. :) I should follow suit and start working on my quilt top pile! you are doing great! i have to start something new right now! I love it all!! Look forward to the one hanging over the window, and LOVE the Sleep blanket. Did you do the quilting on that? It's perfect. Awesome projects - I love you 'Joy' quilt...it is so festive! the fussy fairytales, UGH love it so much! and no, I hardly ever finish anything, but you can totally do it! That fussy fairytales quilt is looking good! Did you follow a specific pattern for that one or make it up? 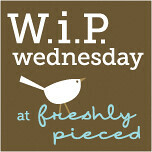 Woohoo for whittling down the WiP pile!! Such an inspiration!